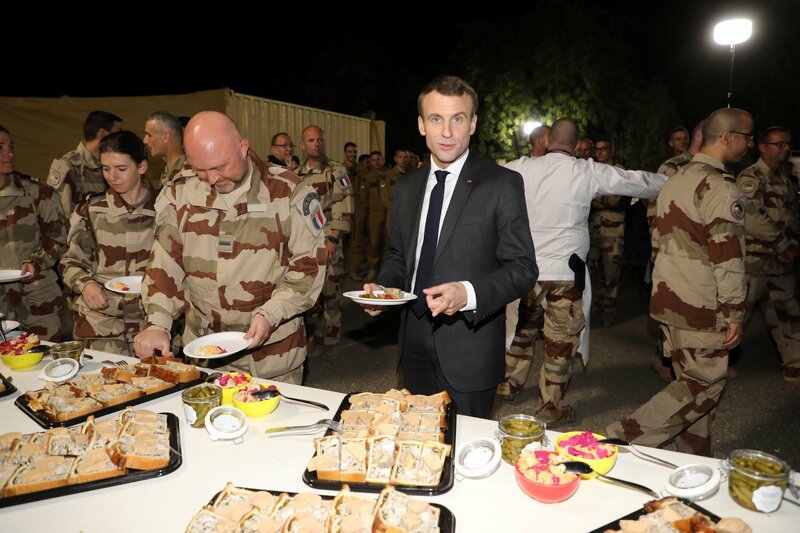 French president Emmanuel Macron eats dinner with soldiers the Barkhane force at the Barkhane tactical command centre in N'Djamena on December 22, 2018. Macron’s personal chef reportedly travelled with him to make sure the soldiers received Christmas dinner from home despite the sweltering heat. The French president also held talks with his Chadian counterpart Idriss Deby to discuss, among other issues, Operation Barkhane, led by France against jihadists in Chad, Mali, Burkina Faso, Mauritania, and Niger and launched in August 2014 in order to help the governments fight terrorism. People blocked by police for hours. Eric Drouet arrested like hundreds other. Movements in all French cities. Gaz sent by Police. While Macron is shaking hands in Tchad. TWEET: “There is Macron in Chad with the military while France is put to fire and sword… Will he buy the military to put them on the front of the stage in France? Eric Drouet was arrested”. TWEET: “Macron is in Chad while France is collapsing”. TWEET: “Meanwhile, Macron plays Santa, visiting our military in Chad. He promises new toys to kill and costs the taxpayers a fortune. The #Yellowvests will get nothing but crumbs. Speaking to the BMF TV broadcaster in Chad on Sunday, Macron called for order in France amid another wave of yellow vests rallies. “The time has come for order, calm and harmony to prevail in the country. Our country needs it, it needs accords, unity and sincere commitment to important common goals. It is necessary to eliminate the existing differences”. The Yellow Vests protests – named after the obligatory attribute of French drivers – have swept across France, starting in mid-November as demonstrations against increase in diesel taxes. Although the French government abandoned the planned hike, the rallies didn’t stop: they transformed into a broader movement against rising living costs and government policies, with many Frenchmen calling for Macron’s resignation. The protests have been marked by violent clashes between demonstrators and the police, with law enforcement officers arresting at least 220 people during Saturday’s protests.